Take some green clean leaves. Wash the leaves gently and drain thoroughly. Mix the binder with just enough water. Put the whole leaf in to the binder mix and make a fold. Put a flat tawa or nonstick fry pan on medium heat for shallow fry. Wet your fingers with water. Take leaves one by one with very little binder. It will just be enough to stick to the leaves. Now shallow fry with 1 tbsp oil in the batches. Do not turn the leaf until it is done on one side, it can easily be moved with simple turn. Let it be fried for a few minutes on the other side. The leaves and the binder will become crunchy, slight black and green in color. Serve with white steamed rice before beginning the meal. It is one of the traditionally preferred recipe or home remedies for childhood pinworm and loss of appetite after chronic fever. 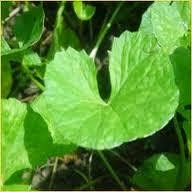 When I was in my senior school, during those recitation days after hard practice of voice lessons for speech and tune-up my elocution the must thing to do was to take shiuli leaf juice and honey-lemon tea to make my voice crystal clear. Nyctanthes arbor-tristis L. or shiuli (Night jasmine), a plant widely used in the traditional medicinal systems of India, has recently been reported to possess hepatoprotective, antileishmanial, antiviral and antifungal activities. 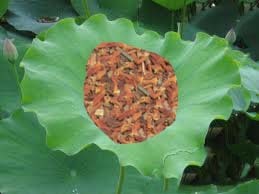 The decoction of the leaves shuili is widely used in Ayurvedic system of medicine for the treatment of internal worm infections, cough, sciatica, arthritis, fevers, various painful conditions and as laxative. Shuili flower gives the greatest nostalgic feeling ever to the Bengalees. 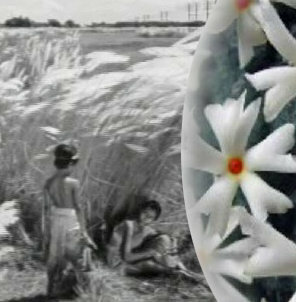 A glimpse of "Pather Panchali"
In the early Autumn the shiuli tree blooms at night and it sheds all its flowers by the morning with dew drops. Its fragrance floats in the air when the flower blooms at night and the gentle swaying of kash flower [কাশ] (Saccharum spontaneum) in the field and the sound of beatings of the dhaak seems to remind the feeling itself that Devi durga is coming home,"Ma Durgar agomoni barta." So as 'Kavi Guru' Rabindranath Tagore expressed a gentle nostalgic feeling by a poem 'I Cannot Remember my Mother' that in the early autumn morning the smell of shiuli flowers floats in the air like the scent of the morning service in the temple comes to him as the scent of his mother. His mother passed away when he was still young. In that poem, he expressed his inability to actually recall the face or the features of his mother, but often a smell of tiny flowers which his mother would string the flowers for the morning worship at the temple, the powerful fragrance of the Shiuli flowers would trigger off happy memories of his mother. The Parijata is regarded in Hindu mythology as one of the five wish-granting trees of Devaloka. The flowers are gathered for religious offerings and to make garlands. The orange pod is used for dyeing silk and cotton, a practice that started with Buddhist monks whose orange robes were given their colour by this flower. The flower open at sunset and before morning strew the ground thickly making like a flower bed. Native women and children collect them in the early morning, separate the orange coloured pods from the white petals, dry them in the sun and preserve them for dyeing their clothes a beautiful orange colour. Traditionally the sari of the Saraswati idol is white or yellow dyed in the natural dye made from "Shiuli" flowers. My mother often used to store dried flower pods to use for a substitution of artificial kesar color for polao recipe. It is a healthy substitute of artificial yellow food color.